IWM rose by 1.9% this week, to a new all-time high. My account did not change. The loss-floor has fallen to -2.2%. World news: Russia has sent troups into Crimea, after a “popular” revolution in Ukraine that the Americans were apparently promoting via the CIA, as is their wont. China and India support Russia. There seems little the West can do about this, so WWIII is probably not imminent. The gap between market performance and my performance (blue line and green bars) has now increased to 3.3%, due primarily to the sudden rally on Tuesday. This was presumably the US Fed doing its usual panic money-printing to prevent the market from falling any further on war fears. My robot’s cautiousness will keep causing it to lose money — until someday the market finally overwhelms the Fed and insists on having a correction, which hasn’t happened since August 2011. A 20% correction is way overdue. 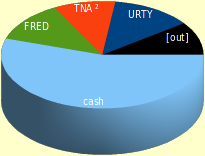 TNA: Jumped out of this, then market rose, then jumped back in. Poor timing! TNA¹: Stopped out just before market reversed back up. Technically a good trade, both profitable and hewing close to model. AGQ: Got a “buy” signal for Friday, but skipped it because SMA(q) was below CHANDELIER⁻(c,a). The recently-added rule to skip these guaranteed-bad trades was ineffective because SLV (which I chart) had a small amount of headroom between limit-price and stop-price, while AGQ (which I trade) did not. YHOO: Buy-limit not reached on Thursday. ATML: Buy-limit not reached Thursday (off by a penny) or Friday (wish I had bought Thursday). Try again next Monday. UWM: Will try to buy it next Monday.